Growing healthy Fast Plants is easy if you understand how the environment can affect growth and development. 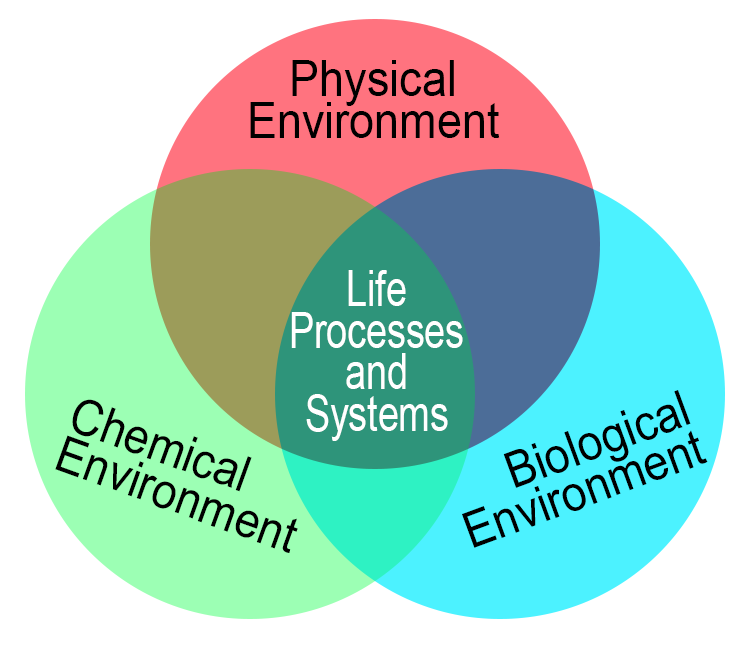 Three broad categories of environmental factors influence how an individual plant matures through its life cycle: 1) the physical environment, 2) the chemical environment, 3) the biological environment. 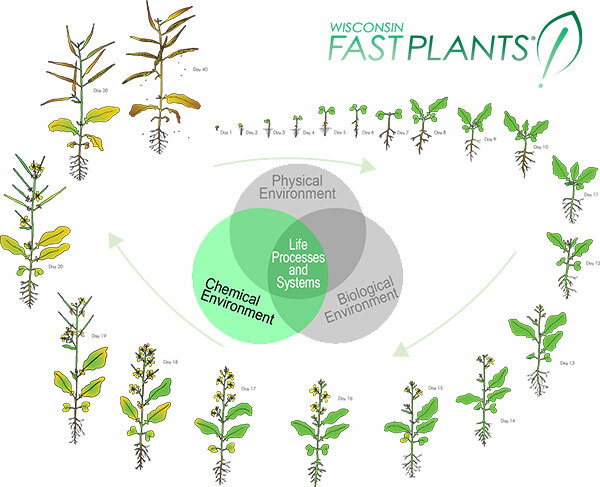 This post is part of a series explaining how key chemical environmental factors can impact plants, Wisconsin Fast Plants in particular. Water serves as the primary solvent supporting plants’ metabolic processes. 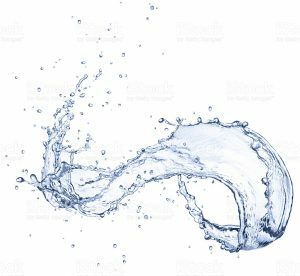 In other words, water carries nutrients and solutes that are needed for growth and development. Water molecules are part of key biochemical reactions. In plants, one of these important biochemical reactions is photosynthesis. During photosynthesis, water molecules are split by light energy. Because water is transparent, it can serve these important functions in plants while allowing sunlight to penetrate beyond surface tissues. This makes it possible for photosynthesis to occur in deeper levels of plant tissue and also in lower leaves and stems. Water enters the plant primarily through the root epidermis and hair cells. From there it travels through intercellular space and cortical cells to the xylem tissue. Xylem tissue throughout the plant distributes water wherever it is needed. Water in the root zone adheres to soil particles as a continuous film created through the cohesive forces of the water molecules. 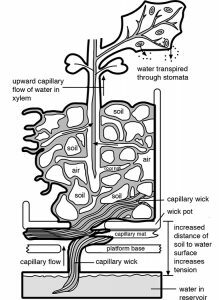 The adhesive forces that attract water molecules to the surfaces of soil particles and plant root cells pull the water into the minute channels within the soil and plant tissues via capillarity. The Fast Plants video on growing systems describes three different, recommended growing systems that provide water via capillary wicking. Adding fertilizer (inorganic nutrients) is the primary way we can influence the chemical environment in which we grow plants. Plants use inorganic nutrients to build the molecules and compounds that are necessary for life processes. Soils in nature contain inorganic nutrients derived from the erosion of surrounding rocks and minerals, decomposition, and deposits transported by water. Inorganic nutrients can also be added to soils or root media in a balanced fertilizer (nutrient) mixture. For ease of use, we typically recommend using a time-release fertilizer pellet that is added during planting. Osmocote is a brand of time release fertilizer that can be found at most Garden Centers. Look for an equal ratio of nitrogen, phosphorus, and potash (NPK) indicated as 10-10-10 or 14-14-14 or 20-20-20 on the label. An alternative to using time-release fertilizer pellets that allows for more precise nutrient control is a water-based nutrient solution. This type of nutrient solution is applied in a measured quantity to your Fast Plants on specific days. One example is Peters® Professional All-Purpose Plant Food (aka Jack’s fertilizer). Peters or Jack’s is a water-soluble nutrient blend that can be applied to the soil surface or mixed into water in a water reservoir to become available for uptake by plants’ roots. Peters or Jack’s contains available Nitrogen, Phosphorous, and Potassium (NPK) at 20% by weight (20-20-20). These fertilizers use urea, ammonium, phosphate, and potassium nitrate as sources of nitrogen, phosphorous, and potassium. It also contains other trace elements that plants use in growth and development. A standard Fast Plants nutrient solution contains 1 gram of Peters® (or Jack’s®) 20-20-20 fertilizer powder per 1 liter of water. In this concentration, we recommend giving each plant 2 ml of solution on days 3, 7, 10, and 14 days after planting..
Nutrients can also be added to the water reservoir so they are continuously available to the plants. 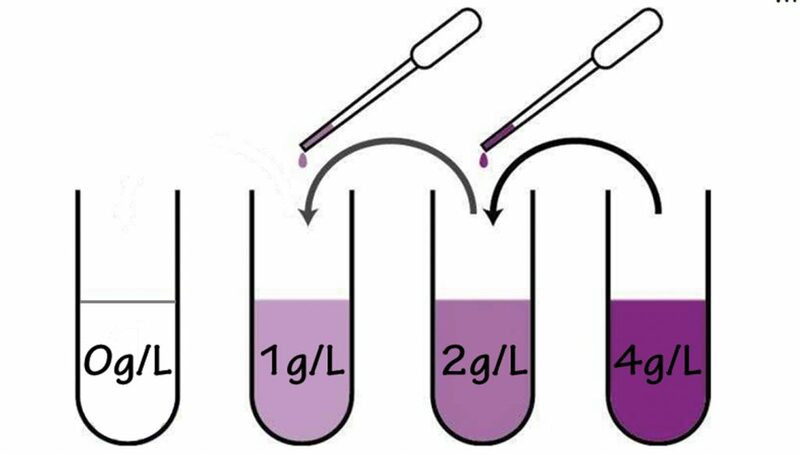 If this method is used, the standard solution (1g / 1 liter) should be diluted to 1/8 strength (1/8g per 1 liter). This solution should also be changed at least weekly to compensate for water evaporation. To more precisely control the nutrients in your plant’s chemical environment use a nutrient solution applied with a pipette to each plant. The standard, recommended nutrient solution for Fast Plants is 1 gram fertilizer per 1 liter water (using Peter’s or Jack’s 20-20-20). Experimenting with lower and higher concentrations can generate valuable evidence about how inorganic nutrients affect plant growth, development, and reproduction. The atmosphere contains a mixture of gasses, and the composition of the atmosphere is part of the chemical environment. 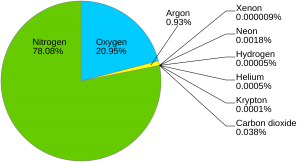 For example, the ambient air that surrounds you contains nitrogen (78%), oxygen (21%), hydrogen and helium (<1%). Although a small percentage of the total gas mixture in the atmosphere, carbon dioxide plays an important role in the Earth’s temperature and carbon cycle. Carbon dioxide and the other atmospheric gasses continuously circulate around Earth’s atmosphere. Carbon dioxide is the source of carbon used by plants to build organic molecules through photosynthesis. Uptake of carbon dioxide by plants and the use of its carbon in photosynthesis is an important part of the global carbon cycle. In addition, plants release carbon dioxide to the atmosphere through life processes that require oxygen. Further, nitrogen in the atmosphere plays an important role in the nitrogen cycle that is essential for plant growth and development. As interesting as it may be, controlling atmospheric composition for experimentation is more complex than controlling some other environmental variables, such as inorganic nutrients. Therefore, you must have sources for the gasses that you want to test and the equipment to measure the atmospheric composition in a closed system where you can grow your plants. The relative humidity in the atmosphere of your laboratory or classroom impacts your plants’ water needs. For example, humidity can affect the rate of transpiration and water uptake by plants. Under low relative humidity rapidly use water and empty their water reservoirs. If water reservoirs run dry, and wicks become dried out, then capillary action is broken. Further, turgor pressure in the plants can be lost, causing plants to wilt and die. Water plants quickly if this happens to restore capillary action. Most importantly, apply water from the top to re-establish capillary action after it’s been broken, soaking the root medium until wicks drip. Once root medium and wicks are thoroughly soaked, return them to full water reservoirs. Growing plants in closed containers causes a build up of relative humidity. If the atmospheric relative humidity is very high (>95% RH), mature anthers in flowering Fast Plants may fail to open (dehisce) to expose their pollen. This can be remedied by circulating air over the plants with a fan; mature anthers will then usually burst open within a few minutes. Like atmospheric composition, controlling the relative humidity in which you grow your Fast Plants for experimentation can be challenging. This requires a closed system and equipment for measuring, adding, or removing water vapor from the atmosphere within the system. If relative humidity in your growing space is low, you may experience persistent wilting. Therefore, if wilting occurs, be sure to check your water reservoir and examine the capillary wicks (and matting, if used). It is key that nothing has dried out and broken the capillary connection between roots and reservoir. Also, if there is extensive algal growth on the wicking material, that can also interfere with capillary action (see more about this in our post about biological environmental factors). In conclusion, water and other molecules and inorganic compounds are essential factors in the chemical environment that affect plant growth, development, and reproduction. Furthermore, like biological and physical factors, we still have much to learn about chemical environmental factors. Together, all these factors influence systems at many scales, including individual plants and plant populations, communities, and ecosystems. How well do you understand basic influences of the chemical environment on Fast Plants? For answers and further commentary, please register for our free online course catalog (fastplants.riselms.com) and visit the Environment and Wisconsin Fast Plants module (http://fastplants.riselms.com/e/87dcf10cad7e01ab#/material/16c8030f4cc32a2c). Plants use carbon dioxide in the atmosphere, and they only produce oxygen. Water in plants is responsible for generating pressure that expands cell walls during cell growth. Plants need other macro-and micronutrients in addition to the elements that they get through photosynthesis. A drop in atmospheric relative humidity can lead to wilted plants. Thanks for reading! Be sure to check out the posts focusing on factors of the physical environment and biological environment!